This year was the turn of Tarr's Fireworks Extraviganza (sic). Those of you who don't know Phil would be forgiven for not having the fear of God put into you by those simple words. It all started fairly simply, Phil produced an old set of overalls which we stuffed with newspaper (making me freeze in the process, oh yes, I forgot to mention, IT WAS BLOODY COLD!). The bonfire was made in one of those fire bins and the guy, which looked a bit like the baby from Family Guy, was propped up on top. 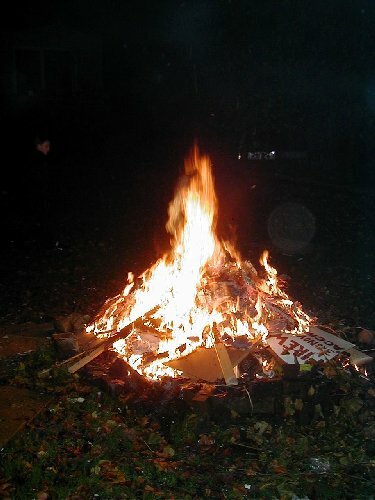 Soon enough the guy went up in flames, and his "guts" kind of fell out of the bonfire and landed on the soil, prompting Rach, who's house the party was going to be held at, to say, "Yeah, that would have been FINE in my back garden". As I came in this morning in the fog created by burning bonfires I reflected on this and on many previous bonfire parties, and wondered how long it would be before they banned bonfires due to them giving off too much carbon dioxide. That would be a very sad day.